عفوا، هذه المدخلة موجودة فقط في الإنجليزية الأمريكية و الإيطالية. For the sake of viewer convenience, the content is shown below in one of the available alternative languages. You may click one of the links to switch the site language to another available language. The Treviglio Anteo spazioCinema has been recently inaugurated, which has 6 rooms for a total of 1277 seats. Among the innovative elements, Macropix played an important role. In fact, two Signum 6 LED screens have been installed on both sides of the entrance, specifically designed for outdoor use, with high brightness. Thanks to the use of high-brightness SMD LEDs, the screen is also visible in direct sunlight and the LED plates perfectly protect the screen from bad weather, condensation and corrosion. A unique product of certified quality. 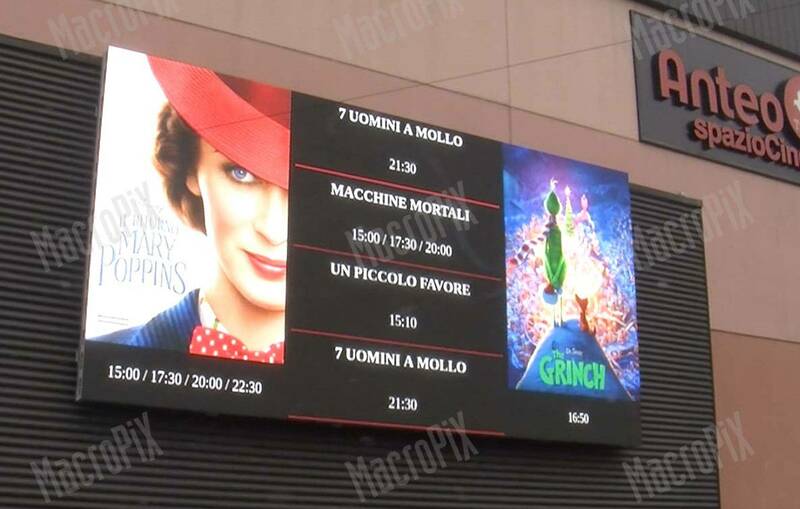 Thanks to these screens, the user passing through and has no way of being updated on the programming inside the structure in a fast, innovative way, capturing the attention thanks to the moving images. The large-scale LED technology is increasingly gaining ground in the dynamic communications sector and is increasingly integrated into urban design.